Grace, homeschooling mother of three, edited and produced Stepping Stones for Home Educators, a national Australian homeschool newsletter, for over a decade. "The price of tuition is the desire to learn. Your degree is a better life." With our eldest child fast approaching adulthood our attention has naturally been drawn to more practical consideration of what to plan for her adult life. Natural learning, that is, following the children's and family's interests, has been our way of life. I don't see why anything should change. I think the children should continue following their interests. But our eldest child is not so sure! Now that her teenaged school friends are talking about choosing university courses and/or jobs in the pursuit of a career, she's wondering what she should be doing. Thus I was drawn to this book written by American, Charles D. Hayes. By the way, this book is a result of the author's own self-education. He attended school but by the time he was seventeen and dropped out to join the Marines, he found school had not prepared him for the Marines or for work life afterward. He had left school with a strong dislike for formal learning. In a sober, easy manner Hayes outlines, explains and supports his ideas simply, with the support of theories and real life practical examples. He closes each chapter with a brief summary of his main points. I appreciated following his train of thought, he is balanced in his reasoning and presentation of information. The book is presented in four parts. Part One discusses why we are the way we are. Part Two discusses the personal sciences and the people sciences, including theories of human behaviour, motivation, life stages, the search for meaning, sociology, politics, management and a range of topics associated with being human. Part Three looks deeply at credentialism: its effects on us personally and on our society. Part Four offers practical advice ranging from understanding personality theories and improving your memory to creating your own credentials and deciding whether or not you should go back to school. The book doesn't have to be read from cover to cover. I still turn to it now, flicking through pages and settling in wherever the page opens. The book is not prescriptive nor is it flippant. Its underlying philosophy is that when self-knowledge is at the hub of our life's focus, anything is achievable and that is the style in which Hayes presents his ideas. He gives a broad base of information, encouraging us to make our own informed decisions about how to plan our lives through self-knowledge. And this is one of my favourites; especially for the numerous people I meet who feel so inadequate because they didn't get a high school certificate. When reading through Part Two (The People Sciences), I was impressed to see that Hayes addressed the "should" issue that has driven our daughter to think she must conform after so many years of living freely. It's a life stage! Hayes looks briefly at the major schools of psychology. It's good to see so many familiar names (Such as Freud, Adler, Jung, Watson, Skinner, Maslow) briefly condensed and compared with each other in order to relieve us of the confusions that come from so many different theories. On page 65 he reminds us that many of these theories underlie assumptions we make in our society. For example, Harry Chapin's song "Cat's in the Cradle" - the song of the father who is too busy for his growing son finds that in old age the roles are reversed and his son is too busy for the father - an example of the theory of behaviourism. Part Three discusses credentialism, particularly relevant to us as home educators is Haye's discussion of tests. (page 150) "Tests can be a valuable aid in determining what remains to be taught or what may have been misunderstood, but they are inadequate as an indicator of the student's future ability." He points out that "The process of self-education is free of grades and tests. It is based on cooperation. But we are still faced with offering proof of our competence if we expect to use the knowledge we have acquired in the workplace." Practical advice on how to document your credentials, looking at personality theories, tips for improving your memory, learning through our environment, books and resource directories are included in Part Four. In my opinion, the best way to prove your competence to gain employment or a promotion is to follow a method like the one used in pursuing non-traditional degrees: simply identify and then document your experiential learning. Submit a request for college credit in recognition of the experiential learning that you have documented. Your goal statement would simply be an effort to clarify your intentions by describing specifically what it is you want to accomplish. If you have difficulty beginning, start by eliminating what you know that you don't want to do. The next step is a chronological resume that is a complete history of your work life. This is for you, not an employer. List each job that you have ever held and what you did specifically. It doesn't matter how many pages it takes. The next step is to write an autobiography. I thought this was silly and almost talked myself out of doing it, but I am glad that I went ahead. Writing your own autobiography in ten to thirty pages is an exercise that takes a lot of discipline, at least it did for me. It is, however, an extremely valuable experience to help clarify your basic orientation to the future by putting the past in better perspective. After you write your autobiography you may have to go back and adjust your goal statement because of the insight you received from your experience. Whether or not you intend to follow such a plan, I highly recommend three books. Two are by Richard Bolles: What Color Is Your Parachute? and The Three Boxes of Life. The third is Self-Directed Learning by Malcolm Knowles. There is no need to try to repeat the advice that they have already given so clearly. Besides, it would take three more books. These guides will be invaluable to you in making career decisions." So, what did I gain from reading Charles D Hayes book? A healthy respect for living intelligently. 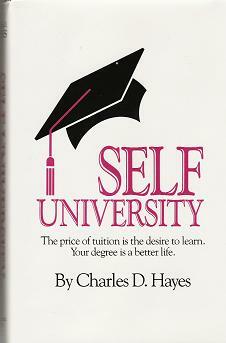 I have naturally chosen to learn through Self-University. His words reminded me to always maintain a balance between using my head and my heart to make decisions. First and foremost is the importance of self-knowledge. I think he reinforced this on every page in one way or another. It's the foundation of living a full life. Know who you are, know how you think, know what drives you, know everything about yourself, then you will understand others and you will be able to act with conviction.